We're almost out, order now to avoid disappointment. 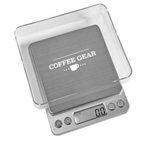 These coffee gear digital brew scales will help you brew up perfectly extracted coffee without breaking the bank. The weighing platform is perfect for a single brew at 10cm2 and the large push buttons with backlit LCD screen make it easy to use. These scales can weigh up to 2kg, accurate to within 0.1g – more than enough precision for all but the most obsessive barista.